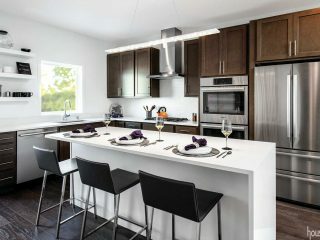 Symmetry was very important to the overall look of the kitchen cabinet design in this remodel. It is easy to see how much Gerrie Bielefeld loves her new kitchen remodel. “If I could fit in a bed, I’d sleep here,” she says with her easy laugh. No wonder. 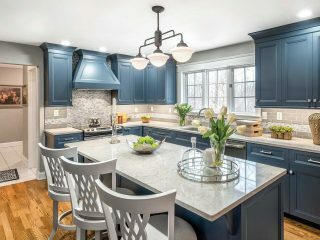 Thanks to unbelievable cabinetry, the kitchen, which is in handsome harmony with the Bielefeld’s lovely 1848 Federal style home in Waynesville, is stunning. 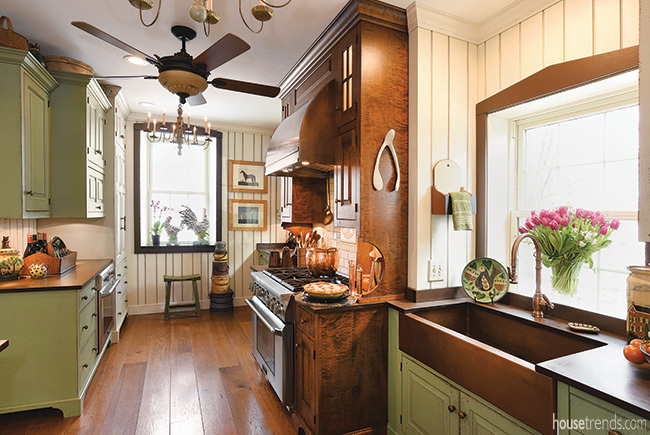 A renovation project in 2014 took Gerrie’s kitchen from outdated to outstanding. 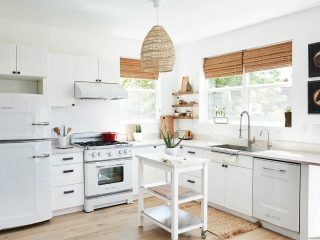 She began the process by doing “a ton of research” to nail the look she wanted in order to keep the character of the house. 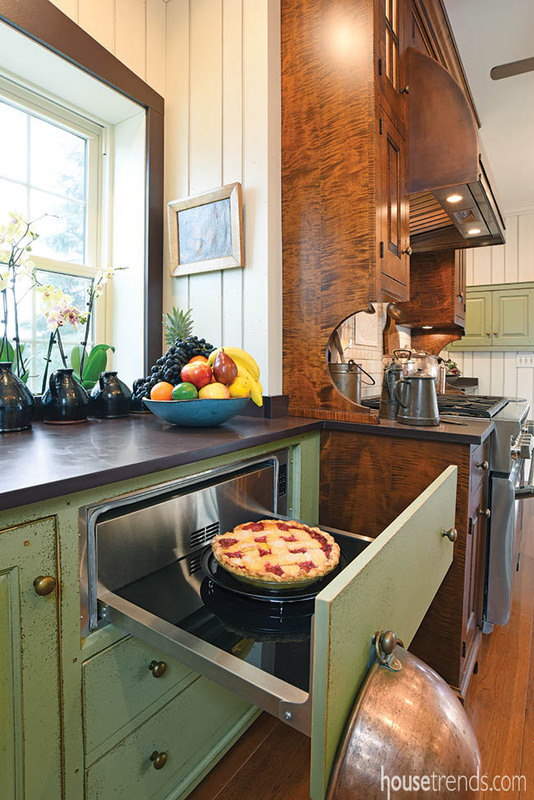 Then Gerrie made another smart move: she contacted David T. Smith, of The Workshops of David T. Smith in Morrow, a designer/builder widely known as the guru of period kitchens. “David Smith is the real deal,” Gerrie says. The pair worked together selecting every element to bring true 1800’s style to the space. 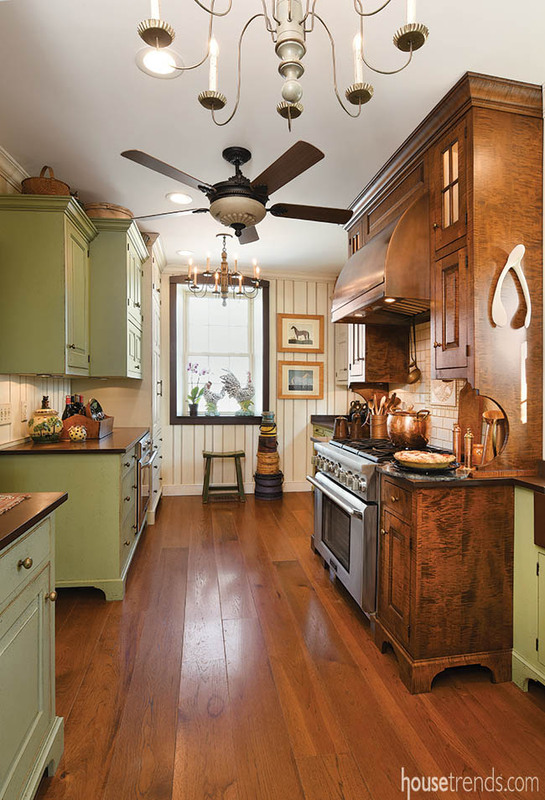 Hickory flooring in 8-inch planks and walls of beadboard set the stage for the kitchen. Smith explains that using random widths of beadboard most accurately mirrors builders in the 19th century who used various widths of boards, never cutting to size because that would be wasting. 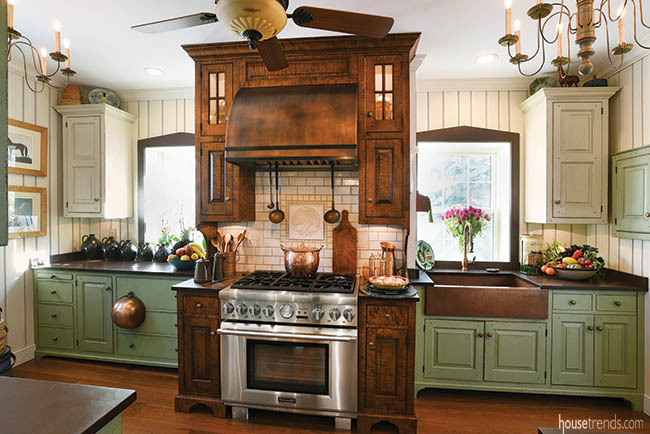 The aforementioned Thermador Grand with six burners is framed in by curly maple cabinets handcrafted by Smith, using “Time Worn Brown” finish. 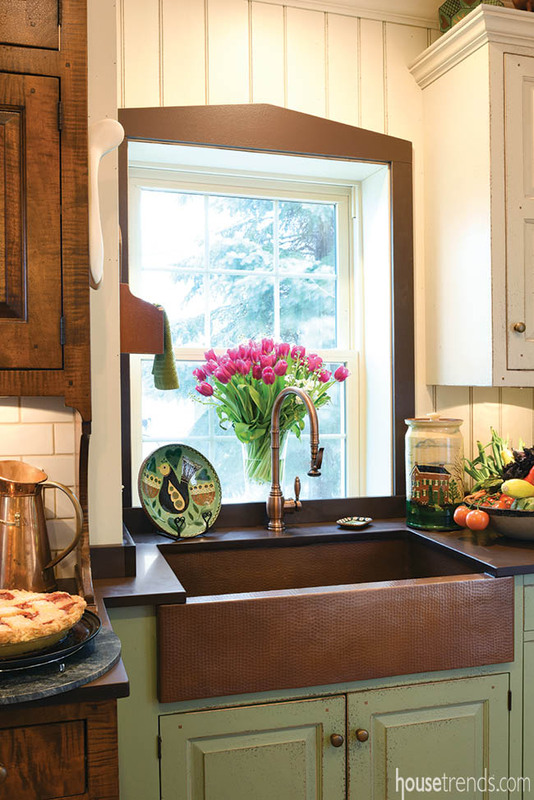 “I’m a fourth generation Texan and I always wanted an antique copper sink and a range hood. David made it work with this kitchen,” says Gerrie, who came to Dayton in 1992. 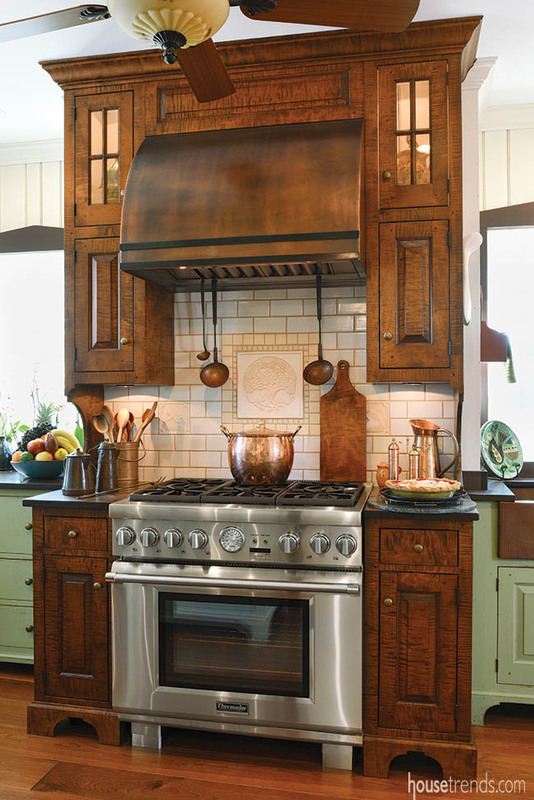 The copper hood, by MetalCraft, is accented with two horizontal strips of black iron to help complement the black range. 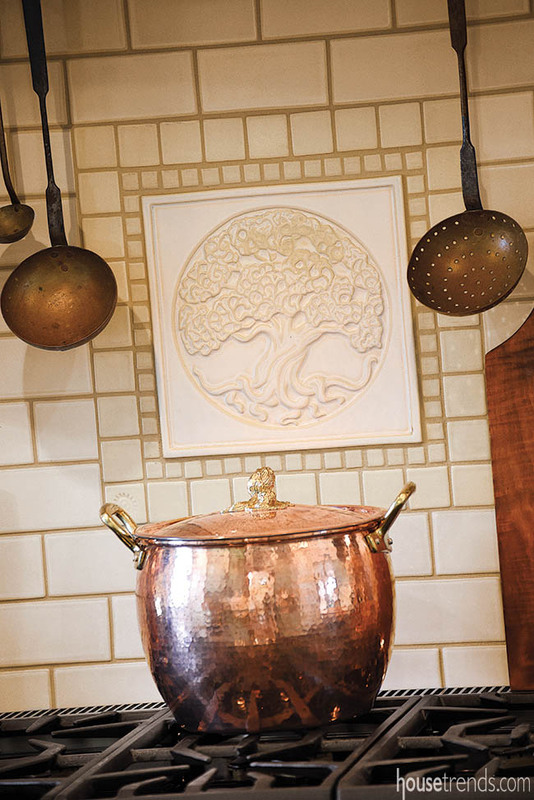 The backsplash features Morning Frost subway tile with a Tree of Life inset, all of which helps to establish the classic look that the homeowner wanted. 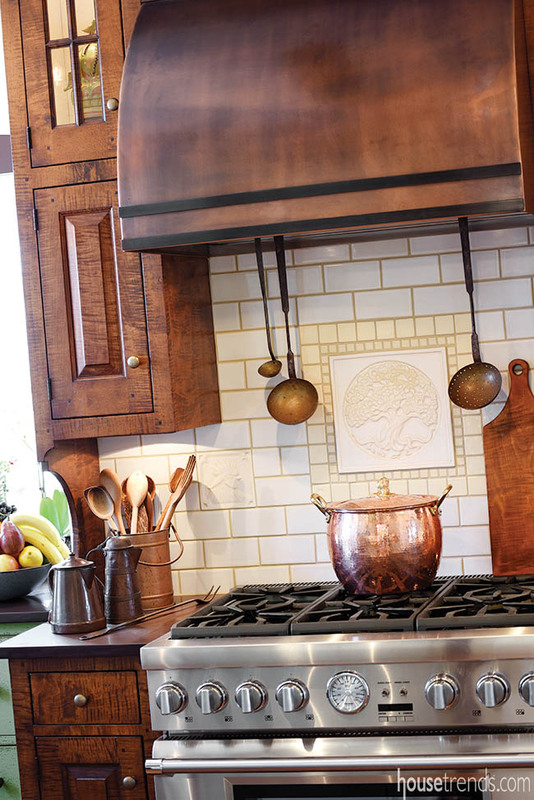 The subway tile and inset are all from the world-renowned Rookwood Pottery in Cincinnati. Smith’s cabinetry expertise coupled with Gerrie’s sense of style is evident in the hanging cupboards throughout the rest of the kitchen. They feature two finishes: Linen Museum (also used on the beadboard walls) and Moss Museum. 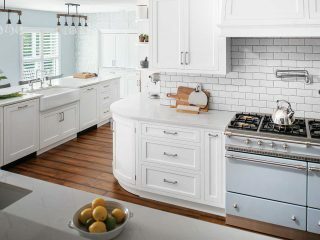 “More primitive kitchens can have five or six cabinet finishes but for the more upscale Bielefeld kitchen, a total of three finishes works well,” says Smith. 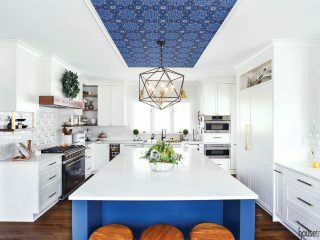 He used raised panels, textured paint-over-paint, special treatments for the edges of the doors and other tricks of the trade to create the 19th century kitchen. 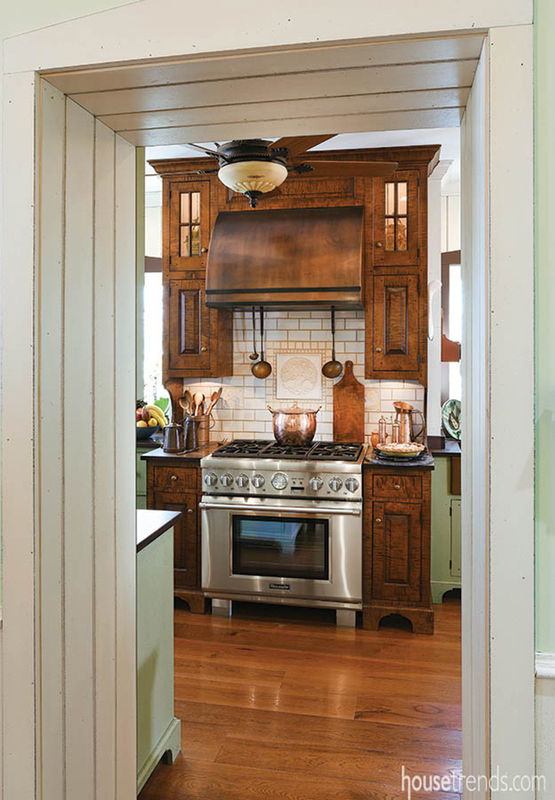 In a historic kitchen, concealing appliances and conveniences is a must and Smith does it exceptionally well. 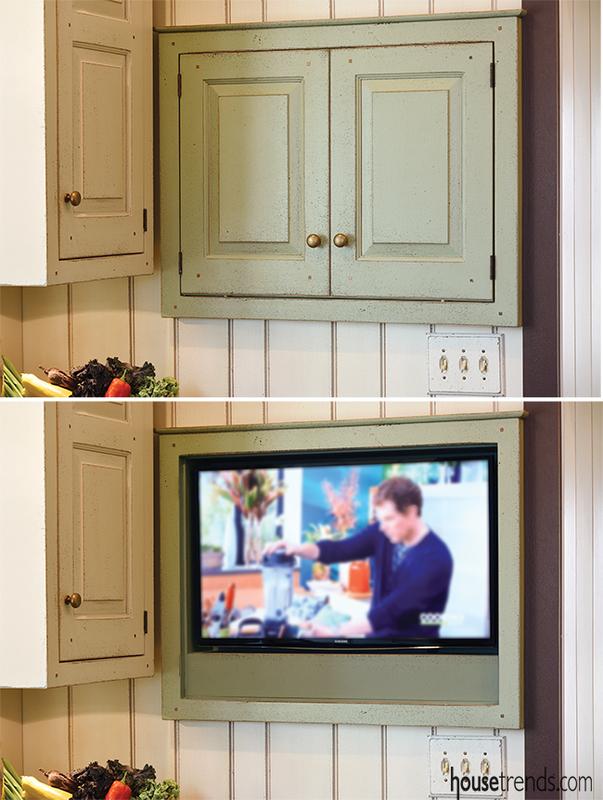 You won’t see a flat screen TV in such a kitchen, of course—unless you look behind a section of flat cabinetry on the wall. Just across the room, a microwave is hidden the same way. 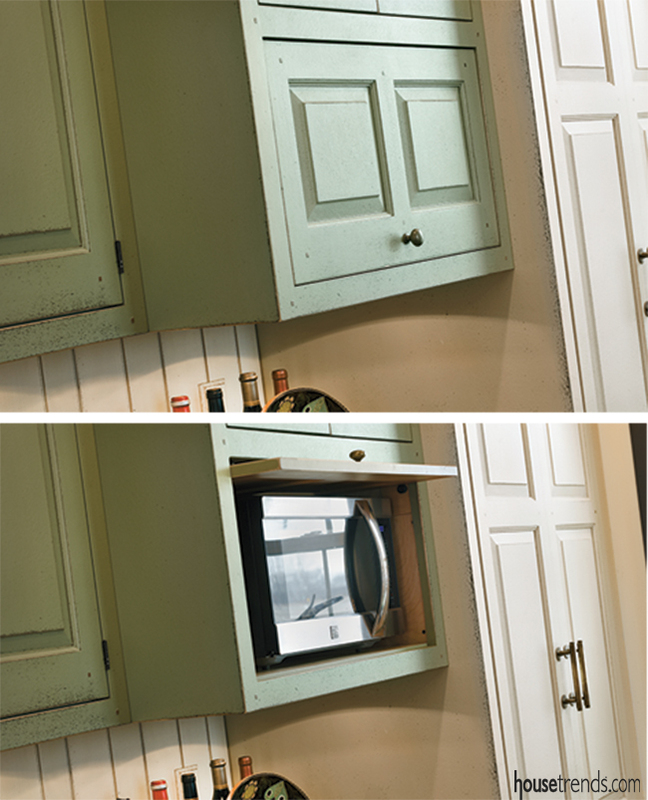 A warming drawer hides behind a cabinetry facade and is easily accessible when the homeowner is cooking a large meal. 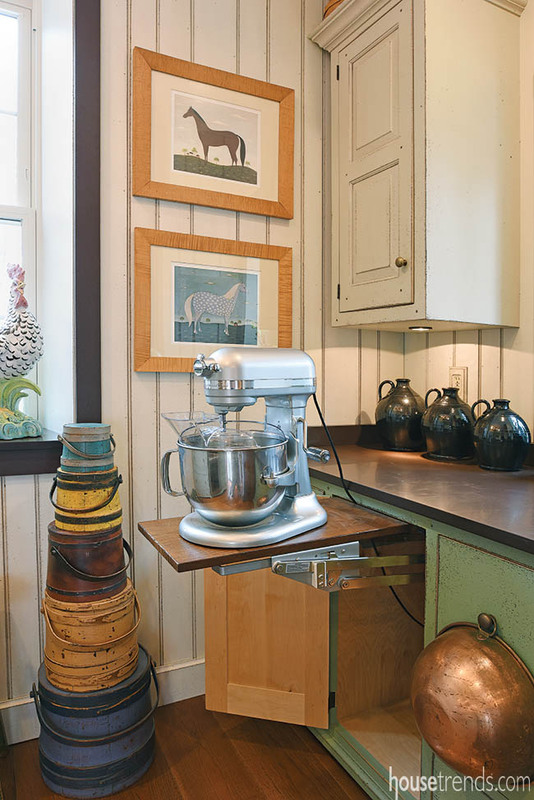 When needed, the stand mixer lifts up out of an undercounter cabinet. 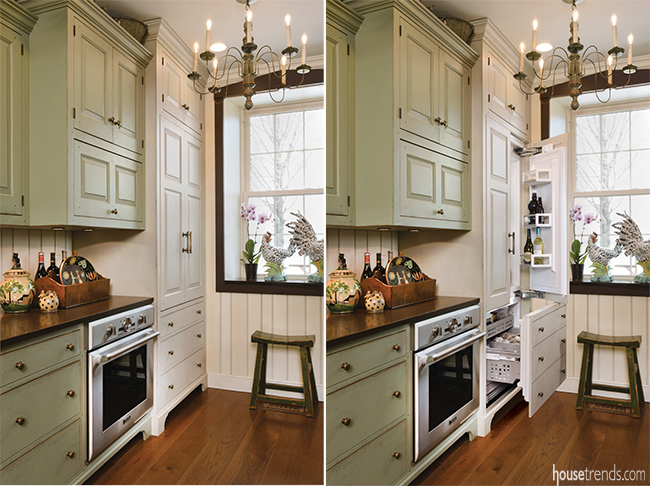 A pair of Thermador refrigerators stands at opposite ends of the kitchen, but politely conceal themselves behind cabinetry. “When you have a house this old and this wonderful, any renovation you do should honor the house,” says Smith.